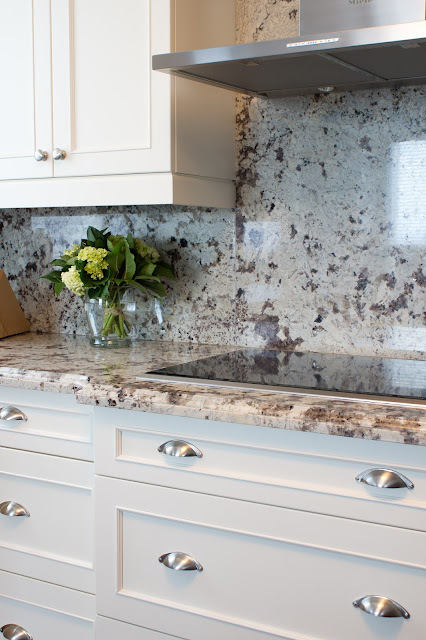 On Saturday, February 23rd, the NKBA awarded Monarch designer Melissa Foley with an honourable mention in the category of Medium Kitchen. Here are the details of what went into her winning design. 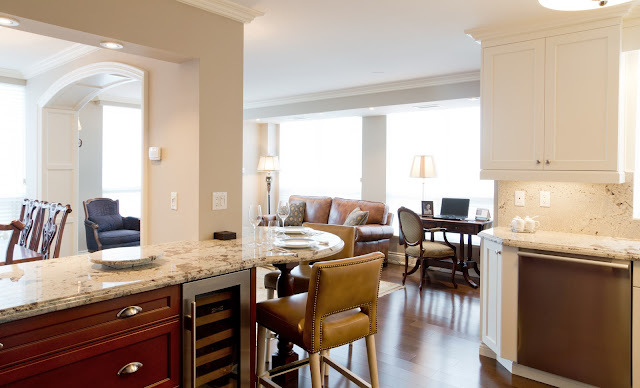 "As recent empty-nesters, our clients were ready to reclaim their living space and make it their own," says Melissa. Located in the downtown core, their condominium already had a contemporary feel. 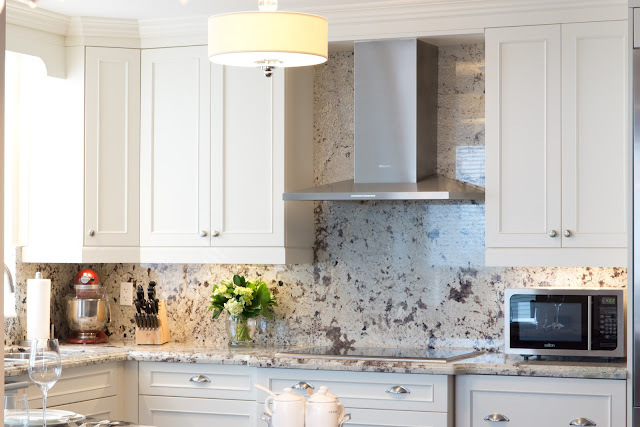 But since they entertained frequently, they wanted a design that was a true celebration of this new phase in their lives – meeting their needs for increased traffic flow throughout their living space while updating to a more sophisticated design. 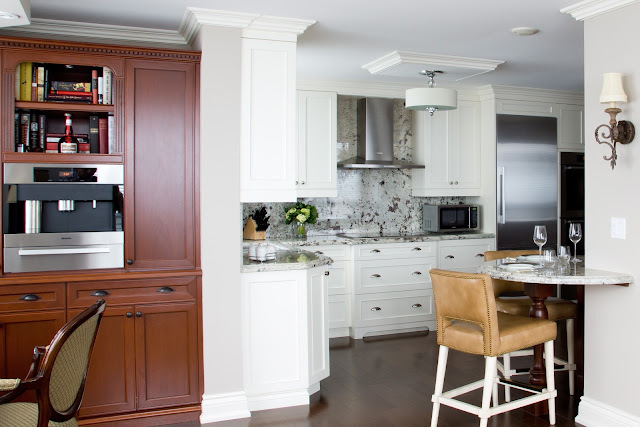 "The couple had differing opinions when it came to the overall style of the space: one wanted a more modern feel that featured off-whites, while the other was hoping for a more traditional design which would include warm wood tones," says Melissa. 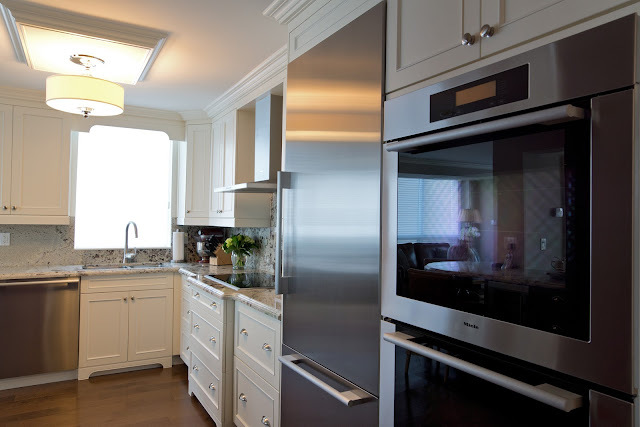 "They also wanted to incorporate additional lighting and appliances into their new design. To create more living and entertaining space, a spare bedroom adjacent to the kitchen would be converted into a dining room, ensuring that its design flowed effortlessly with the rest of the living space." Crown molding was installed throughout the condominium, and wiring was run through the crown to allow for additional appliances, electrical outlets and under-cabinet lighting. 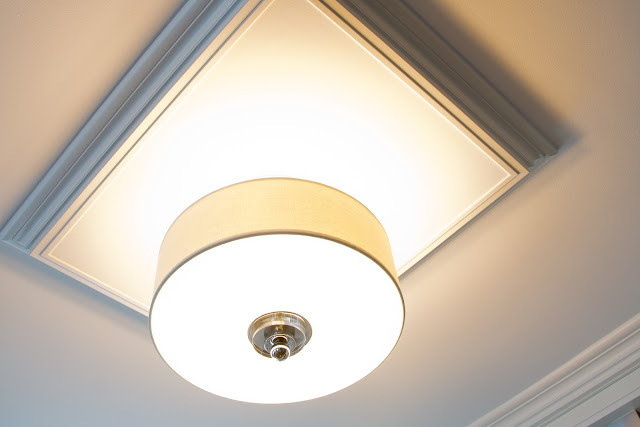 Custom ceiling boxes were added and provide an added design element while allowing lighting fixtures to be centred in both the new kitchen and dining room spaces. Marital design harmony was achieved through the use of two tones: cream on the work side of the kitchen and a medium brown on the breakfast side and hutch. 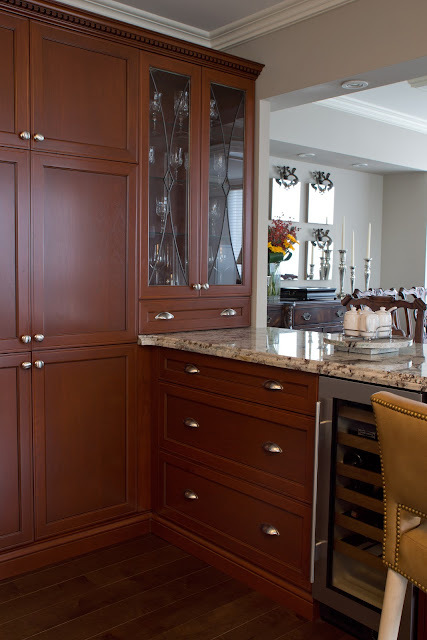 The cabinetry also represents an effective design compromise with a more modern look on the cream side blending effortlessly into more traditional cabinetry in medium brown. To accommodate the flow of the crown molding, the breakfast nook and hutch were kept at a different installation height. Rich granite counter tops and backsplash tie in both tones nicely, as does the new hardwood flooring installed throughout. 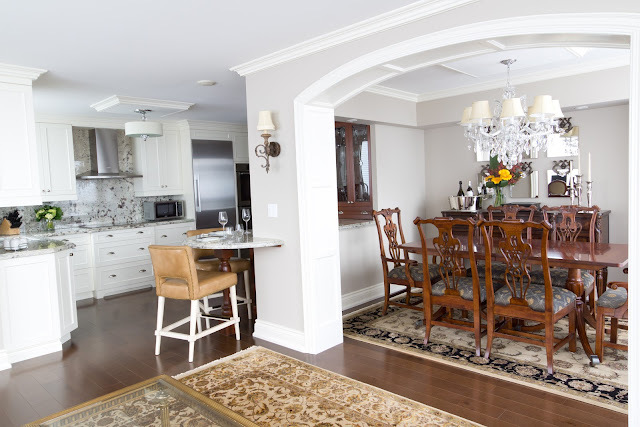 Matching the crown molding, archway, baseboard and trim colour to the cream cabinetry allowed for all aspects of the living space to flow effortlessly.